Screen shot of a Chinese state television report on the visit of Turkmenistan President Gurbanguly Berdymukhammedov to Beijing. China and Turkmenistan have agreed to establish a "strategic partnership" during a visit by President Gurbanguly Berdymukhammedov to Beijing. With Turkmenistan, China now has strategic partnerships with all five Central Asian states; it established them last year with Tajikistan and Kyrgyzstan. 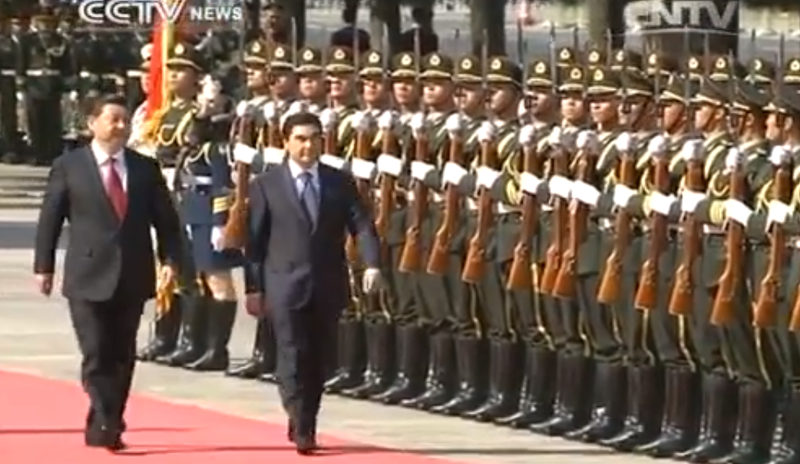 Clad in skirts, riding boots and hair pulled back into the classic chignon, 13 women soldiers from China’s military debuted as honour guards on Monday to welcome the visiting Turkmenistan president. They are the first female People’s Liberation Army honour guards since the squad was established in 1952. Their attire of knee-high skirts and five-centimetre heels singled them out from the rows and rows of sober, hunter-green uniforms of their male comrades. Their presence apparently left an impression on President Gurbanguly Berdimuhamedov, who is in China at the invitation of President Xi Jinping. “It’s very nice, very good,” Berdimuhamedov said of the female soldiers. China-Turkmenistan ties are, of course, focused on energy. Just last week Berdymukhammedov inaugurated two new Chinese-built gas processing facilities, and gas exports are scheduled to increase from about 25 billion cubic meters this year to 65 billion in 2020. During his visit, Berdymukhammedov also visited the offices of the China Aerospace Science & Industry Corporation to talk space cooperation. And the two sides signed deals to increase cooperation on infrastructure, telecommunications, agriculture, health care, and technology. So far, the security relationship has lagged significantly behind the economic one; officially neutral, Turkmenistan isn't even a member of China's Central Asian security group, the Shanghai Cooperation Organization. But Chinese President Xi Jinping nevertheless highlighted Turkmenistan's security role: "China highly appreciates Turkmenistan’s efforts in maintaining regional security and stability," Xi said. China recently promised "hundreds of millions of dollars" in military aid to Tajikistan, so it's possible China's views on military ties to Central Asia may be changing.